This entry was posted on December 13, 2016 at 8:39 am and is filed under Comedy, Drama, Music, Musical, Romance with tags 2016. You can follow any responses to this entry through the RSS 2.0 feed. You can leave a response, or trackback from your own site. I’ve heard many claim this is the no-brainer winner for award season. I can’t wait to see it. It certainly is a strong contender for a lot of awards. However there are other films that should be strong competition as well: Moonlight and Manchester by the Sea among them. It’ll be interesting to see how it all pans out. Yes, I’ve heard great things about each. It’s a very refreshing new experience that ties into nostalgia (so old and new at same time). I had a few issues with it but still very much enjoyed it. For me, it lived up to all the advance hype. One of the very best (if not THE best) of 2016. That’s awesome. I don’t know if it did for me but I still enjoyed it. What’s good about it is really good so I get it. I just wish the songs had been more memorable and the character motivations a little more fleshed out. But I’m like the one person who had that issue with Whiplash. Nevertheless, it was a refreshing fun time at the movies. Light, breezy and very enjoyable. Beautiful cinematography and dancing. Wow you sound kind of lukewarm about it. I’m surprised it made your Top 10. Interesting. I see at least a hundred movies a year. I know you do as well. My Top 10 is filled with movies I completely loved. I’m not quick to point out their flaws because then I feel like I’ve created an unattainable standard. I suppose I do grade on a curve, but I still found 1o movies in 2016 I can champion without reservation. I like to do that because it encourages those who don’t see as many movies as I do, to see the very best ones. Yeah I know what you are saying. I guess I’m struggling with my top 10 list because I like things for different reasons. Something like Kubo I see some flaws more I think about it but I loved it. Even Zootopia I get the metaphor of race falls apart a bit but I still loved it. 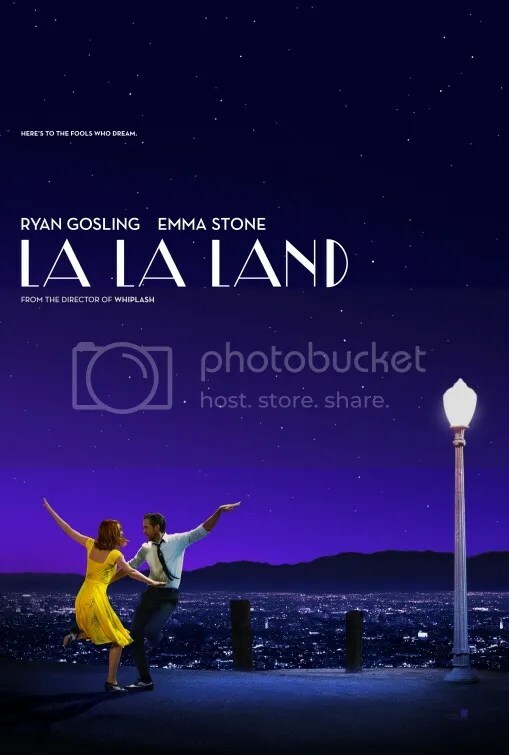 I don’t know where La La Land will end up but I did enjoy it. But it’s interesting what you say about unattainable standard. Perhaps I do overthink it. Some movies like Inside Out and Sing Street for me I just love the more I think about them but I guess all movies dont need to do that. That’s a shame. It was probably the happiest experience I had at the movie this year. It was such a hopeful, exuberant musical drama – the kind that hasn’t been made in decades. It was rather bold in this day and age. I absolutely loved Whiplash and I’m super curious about this director’s latest flick even though I’m not the biggest fan of musicals. So many great movies for me to catch up on. Good review. I will never get tired of this film. btw, mr. Hobster. Where’s your “Best of 2016” post?! when can we expect that sweet nectar? I will post this Saturday (December 31st). This is finally coming out where I am soon and I couldn’t be more excited. An exquisite review Mark. Thanks! That’s good to hear it’s come to North West England. Let me know what you think. I’ll be certain to clue you in on my thoughts. I get why you loved La La Land, but I found it highly overrated. I respect it as an artistic piece for its homage to Hollywood films of yesteryear. Its production design, camerawork, and its timing are incredible. I found it lacking in the musical and emotional substance to carry its two hour run time though. I thought its lyrics, dancing, and singing never rose above mediocre. I had problems with the film’s story too. I didn’t feel like they developed the characters enough for me to care about them or their romance, which felt more random than warranted. I didn’t understand why she kept going after him even though he kept acting like a jerk to her. However, I loved the final act. Heartbreaking and captivating final number. Wow. I suppose he acted “like a jerk” to her in the beginning but they warmed up to each other pretty quickly. That animosity is a prerequisite to almost every romance. They have to hate each other first before they can fall in love. Yeah I get that, but I felt like he continued acting like a jerk even after they got together. I didn’t see the necessary depth of character to show me he was a nice guy worthy of her affection.